On the heels of the undergraduate conference held at the University of Tennessee on February 25 that was reported earlier, four students traveled to the University of North Carolina – Chapel Hill on March 4 to present their research and engage with fellow junior scholars. 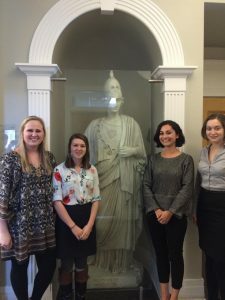 Sarah, Gwen, Hannah, and Sarah are the most recent names added to a lengthening list of CofC students driven to intensively engage in conversations about the classical world and its impact upon our own. Congratulations on a job well done! This entry was posted in Research, Student and tagged Classics, conference, LCWA, Research, Student. Bookmark the permalink.